The perfect accompaniment for barbecued chicken or fish. Lightly brush 2 boiled ears of corn with oil; cook on a hot griddle pan until tender and golden. Run a sharp knife down the sides to remove the kernels. Mix in a bowl with the diced flesh of a roasted, skinned pepper, 125g chopped cherry tomatoes and 1 small diced red onion. Stir in 1 tbsp chopped jalapeno peppers, the juice of 1 lime and 1 tsp caster sugar. Season; stir in 2 tbsp chopped coriander. 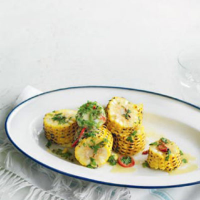 Serve with grilled or barbecued chicken or fish.